It’s that time of year again! Time when many people declutter, dust, spruce up, and renew their physical spaces, known as spring cleaning. It’s also a good practice to take this time to spring clean your parenting. Revaluating our goals and practices every year helps us parent consciously so we don’t fall into bad or unconscious habits that may drag us down. As you take the next few weeks to renew your physical spaces, also take this time to renew your mental spaces. We tend to think of parenting as the physical act of feeding, diapering, bathing, teaching, and disciplining children, but how we approach these tasks all begin in the mind. 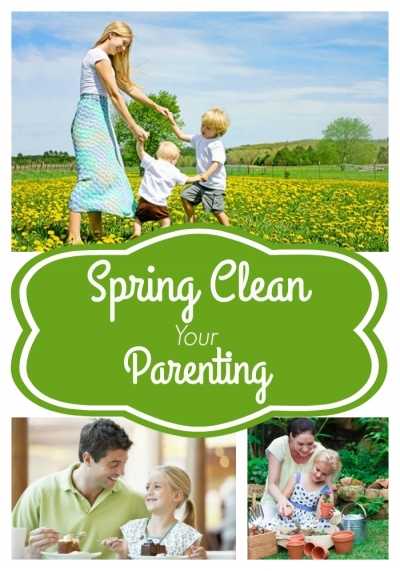 Below is a guide to spring clean your parenting. Are your days filled with too much activity? If you’re feeling irritable and constantly run-down, take this opportunity to re-evaluate your schedules and habits. Have you taken on too many commitments? Do you spend too much time on social media or Candy Crush? I find that when I limit the time I spend on the internet, I have more time for things that really fill me up, like reading and writing. When I’m filled up, I’m more patient with my children and able to give more to my loved ones. Perhaps it’s also time you declutter your ideals and goals. There is parenting advice and information coming at us non-stop these days. What we were told was definitely “right” yesterday can be disproven by the latest study today. With the constant stream of information comes a giant load of “shoulds” and “should nots” that need to be weeded through. I found myself overwhelmed when I scoured several parenting pages per day, all offering conflicting advice. I decided on two or three trusted resources and drastically thinned out my Facebook feed and unsubscribed from loads of emails. I felt much less overwhelmed. Above all, I learned to listen to my own intuition.